"Free" is still a compelling word in advertising. 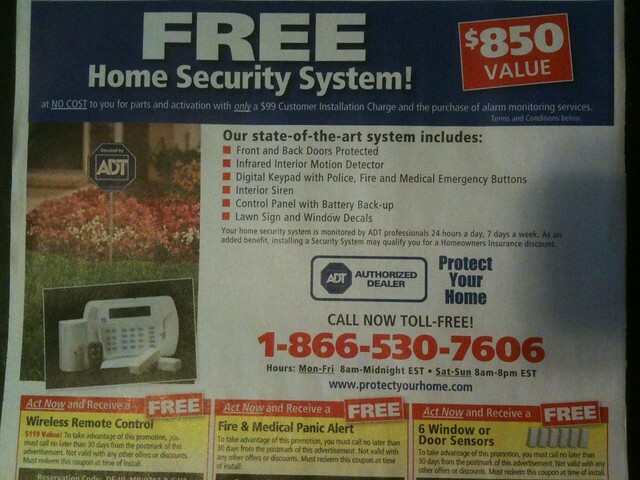 I know this advertisement is working for ADT because I've seen it for months in Val-Pak and free-standing inserts (FSIs) in the newspaper. How does ADT make money on this? The same way a phone company makes money by offering free cell phones with a 2-year plan -- if you can give something away to create a customer who buys from you long-term, you win. This model can be applied to any business, in any industry, including yours. 1) What can you give away to create a customer? 2) What incentives can you offer to make people act NOW? 3) What's your strategy for locking in customers who buy long-term? Meanwhile, if you own a business, there's a box of 11 Marketing Multipliers waiting to be shipped to you. You can try it Free. Click here now. Have you heard the "Get Your Weekend Back" radio ads for Ace Hardware? They're an outstanding primer in the fine art of turning features into benefits. Remember the old advertising saw (pun intended): Nobody goes to a hardware store to buy a drill bit. They go to buy the hole the drill bit makes. In other words, nobody give a rat's behind if you have a huge selection or great service. Those are features. Your job, as a business owner or marketer, is to tell buyers how what you do will improve their lives. In other words, you must translate features into benefits. Or you will starve. "Rockstar Parking — Our storefront parking helps you get in and out faster." This is a nice benefit for anyone who dreads those huge parking lots at big box stores. "In-store Wingman — From the second you walk in, you'll get help from people who really know their stuff." The faster I can get my questions answered and find what I need, the happier I'll be in almost any store. "Primo brands — Only we have the best brand names without having to leave the neighborhood." The benefit here is that I can find the top brands without driving too far to get them. "Speedy-sized stores — Our shopper-friendly stores allow you to zip in, find what you need and zip out." Lots of good selling here. Any store that I can zip in and out of, I like! "Local know-how — We live where you live, so we know exactly what you need"
It's almost like you're stepping back in time, when the local hardware store was a center for conversation and news. If the people at Ace stores really do know what's going on in their neighborhood, I'm even more likely to shop there. All in all, this radio ad is a near-perfect example of how to turn dull features into saleable benefits. Study it. I just got a call from a prospect who downloaded my Free Client Cloning Kit about 4 weeks ago. But my records show that he never opened ANY of the emails that I sent him to follow up. So, why did he call me back? Because I also sent him a printed letter by MAIL. No. I printed and mailed him an actual letter, delivered by the U.S. Postal Service. On paper. With a stamp. As a result, he called this morning and was very excited to talk to me. He said, and I quote: "The letter you sent was so interesting that my wife called me while I was out of town to tell me about it." Can your email do that? Can any email do that? Meanwhile, we had a very nice talk by phone. He's sold on my abilities as a copywriter. 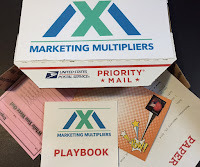 And none of this would have ever happened if I hadn't used direct mail to augment my email marketing. Something to think about in your business, eh? Especially if you've come to depend heavily (too heavily?) on email or social media to find, get, and keep clients.